Background: The present paper investigates the corrosion inhibition of copper using six corrosion inhibitors namely: 4-phenyl thiosemicarbazide (PTSC), Salicylaldehydethiosemicarbazone (STSC). 5-Mercapto-1-methyle tetrazole (MMT), 5-(3-Pyridyl)-1H-tetrazole (PyTA), 5-phenyl-1-Htetrazole (PTA) and 5-Amino-tetrazole monohydrate (ATA). 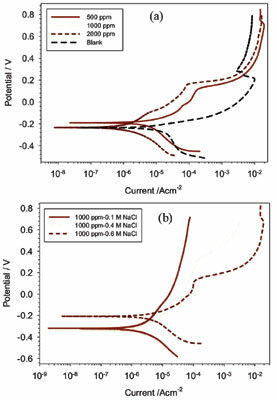 Method: Copper samples were tested using potentiodynamic polarization technique in the absence and in the presence of corrosion inhibitors. Results: Results show that tetrazole derivatives show high inhibition efficiencies (≥90%) in comparison to thiosemicarbazide derivatives (<80%). The highest inhibition efficiency of 92.9% was shown by ATAH at 2000 ppm. The order of inhibition efficiencies of the tested compounds was as follows: PTA≈ATA >PyTA> MMT > STC > PTSC. Corrosion inhibition, copper, sea water, thiosemicarbazides, tetrazoles, inhibition efficiency.